Secret service agent Ethan Burke arrives in Wayward Pines, Idaho, with a clear mission: locate and recover two federal agents who went missing in the bucolic town one month earlier. But within minutes of his arrival, Ethan is involved in a violent accident. He comes to in a hospital, with no ID, no cell phone, and no briefcase. The medical staff seems friendly enough, but something feels…off. As the days pass, Ethan’s investigation into the disappearance of his colleagues turns up more questions than answers. Why can’t he get any phone calls through to his wife and son in the outside world? Why doesn’t anyone believe he is who he says he is? And what is the purpose of the electrified fences surrounding the town? Are they meant to keep the residents in? Or something else out? Each step closer to the truth takes Ethan further from the world he thought he knew, from the man he thought he was, until he must face a horrifying fact—he may never get out of Wayward Pines alive. If you’ve watched the show, then there’s very little that’s new for you here. If you’re trying to choose between the book and the show, read the book first. I watched the first few minutes of the TV show, but it was one of those nights that I was not in the mood for TV. So, I changed the channel vowing to read the book as soon as possible. In the spirit of transparency I want to say that I am biased because I love the author’s writing. His Dark Matter was the first and only book to this point that I read, and I was floored. So for me this was, Wow. This was an entertaining read. Operative word = entertaining. Leave your disbelief outside for the time being. Like Dark Matter, it is best to go into this story as blind as you can. I went into this only knowing that Blake Crouch wrote it and because I loved DM, I decided to give this a shot. Even with all this love, I think I had to renew this book three times, because I kept putting it off, “I know Blake wrote this, but no way is it good as good as DM. If I don’t get to it this time around, I’ll return it unread and check it out some other time.” I went into this blindly and with no expectation that this would be great. Good maybe, but not great. Man, I love being wrong. Some folks had problems with the fragmented writing, others said that it mimicked Ethan’s short bursts of progress and helped them get a feel for what he was going through. I had neither problem nor revelation with the writing. It made me care for the characters, filled me with suspense and had me turning the pages well into the night. I’m going to assume that you didn’t read the blurb above, that way I can just repeat it here and it won’t feel repetitive. 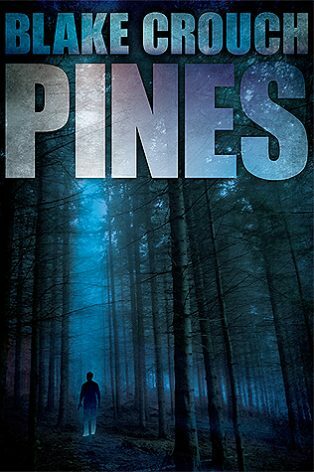 Secret Service agent Ethan Burke is sent to Wayward Pines, Idaho (of course it had to be Idaho, where I hope to find my forever home next year) in search of two missing federal agents. He’s involved in an accident and wakes up with no ID, no phone and his briefcase is missing. As the days pass, he wonders why he can’t get in touch with wife or boss and why this small town is fenced in. Ethan is figuring out that there is something not quite right with this town. Try as he might, he can’t leave. I was hooked. I needed to know what was going to happen next and it couldn’t wait. Once I was a good bit into the book, I had enough information to make a guesstimate as to what was happening. There’s only one logical explanation, unless the author was going to introduce Dumbledore into the mix. I made an educated guess and figured out what happened to him but the why and everything else, floored me. I was gobsmacked. I read the last few chapters with my jaw in my lap, catching flies and possibly drooling a little. To say that I was surprised is an understatement. A couple of times I shook my head thinking maybe my mind was foggy and I was seeing something on the page that wasn’t there or I just read something incorrectly. Nope, it was Blake doing Blake. I read this series first by Blake Crouch, became and fan, and then was blown away by Dark Matter. Thought about that one for days after finishing it. I could kick myself for not having read his works sooner. Luckily I read Dark Matter when I did and I can now right my wrongs 🙂 I too was thinking about that long after I finished it. I remember thinking that I didn’t realize what Blake did with words and imagination was possible. I haven’t read Dark Matter yet but i have a copy of it. I also really want to read this one so I’m glad you have it 5 stars! I hope you enjoy them. I went into both stories knowing as little as possible and my experience was better for it. I’ve since read reviews for Dark Matter that break down what the story’s about, removing the Where’s The Fire moment for the reader. Not cool. It sounds like I should really try a Crouch book sooner rather than later, hey! I think you should Liz. No shame, though. There are simply too many books (not a bad thing) and not enough time. That is why I’m so grateful to be part of this amazing community. To the many book bloggers that have introduced me to so many wonderful authors and stories that I would never have been able to find on my own, I say Thank you. I was actually going to comment on the book when I noticed I could comment and got sidetracked with my enthusiasm haha 😛 Is that bad? I have waited so long for this moment.. This is on my TBR though and my Kindle. I just can’t seem to get in the right mood. 😀 Not bad at all. I was like that when my cable was fully converted to HD. I don’t watch much TV but I was super excited to have it. Okay, 12 months is not that long. Let’s not make a federal case out of it. Bellyaching for 14 months that you can’t comment; I’m still not convinced that you didn’t break anything, but whatever. Yeah, if you’re not in the mood, then I would definitely suggest you wait. Maybe it’s worked for some, but I don’t see this as a story to get out of a slump or one you power through, if that makes sense. NB I may have exaggerated a little in regards to the months spent bellyaching, but not bellyaching. Alright, in regards to the bellyaching too. I’m glad you’re back. Thank you very much. If I win where do I go to pick up this award? Will there be a red carpet? Do I have to dress up? I like dressing up. All seriousness aside, I am humbled. Thank you. Congrats on your nomination. Where in the H-E-Double Hockey Sticks have I been??? I hadn’t even heard about this book. Loved Dark Matter. Must. Get. Copy! 😂😂😂 I hope you enjoy it!